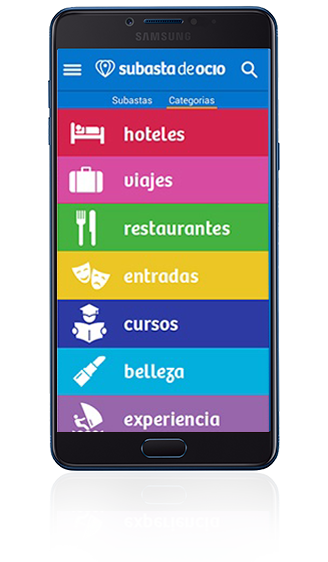 @SubastadeOcio is a Spanish app that auctions empty hotel rooms, unused restaurant offers and other leisure activities. Their goal is to fill all hotels, restaurants, spas & other leisure activities and make people happy instead of having unused beds or dining tables. Auctioning leisure activity is a new concept of ecommerce in Spain with its main difference in the way that users decide the price they are willing to pay for their offer, with all auctions starting at €1. To manage 7 different product categories with a maximum level of custo- mization and segmentation within every category. While at the same time increasing the volume of application installs, improving CPI and learning the metrics for each category. The first part of the solution was to integrate software with Twitter API, which was capable to generate all of the campaigns, tweets and possible segmentations in a few minutes. The second part of the solution was to use algorithms based in artificial intelligence that were able to make decisions in real time in order to optimize the campaign results. 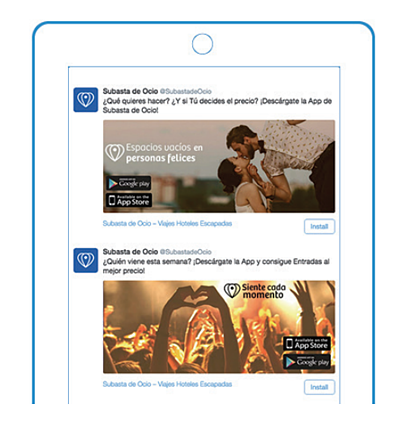 @SubastadeOcio wanted to increase their marketing efforts in mobile channels given the success that they experienced in other platforms. They saw Twitter as the perfect place to increase mobile app installs and reach new audiences. The first part of the strategy was to create a data structure that permits the production of a large number of unique segmentations adding hundreds of Twitter cards in each one in a matter of minutes. This allowed for the creation of thousands of unique combinations of Twitter cards per segmentation and at the same time easily managing them all. The second part was to develop a system capable to take real time decisions per every promoted card using the Twitter API in order to always run the Twitter campaigns with optimal metrics. To identify the best segmentations @SubastadeOcio ran a lot of different combinations in order to create a very specific target. That situation allo-wed them to know the best segmentations and at the same time the best Twitter cards per segmentation, which was key information to optimize the campaign and to learn from the audience. @SubastadeOcio used the image card to allow users to download their app. This card combines unique images with a call to action. The user is able to install the app without leaving their timeline in just one click. @SubastadeOcio ran campaigns for 7 different categories of products at the same time. For each category they launched several Twitter campaigns using Twitter cards customized for the category. This combined with the highly segmented campaigns produced the end result of a large number of unique combinations of Twitter cards and segmentations completely relevant for the specific category. They were capable to do this and handle the structure using the Twitter ads API. At the same time, given that approach, they were able to know the exact CPI and marketing metrics per category, which was a key point for Subasta de Ocio. This allowed them to make different marketing strategies and decisions given the company’s priorities. The cost per install was decreased by 43,17%. The 7 different product categories were launched simultaneously with up to 272 different segmentations running simultaneously per category. There were more than 7K unique combinations of tweets per segmentation tested to determine the combinations that delivered the best results. With these results @SubastadeOcio was able to improve the CPI, increase the reach and obtain actionable marketing data.